My great grandfather, William Henry Buxton lived on Dolphin Street and worked at Nunnery Colliery in Attercliffe. His name appears on the Dolphin Street War Memorial, although it has been incorrectly transcribed as A.H. Burton. He served with the 14th Gloucestershire Regiment, which was a bantam battalion, made up of men under the army regulation height of 5’3” but who were physically strong e.g. miners and farmers. In 1916 the battalion were assessed for their level of fitness and a number of men were transferred to the Labour Corps,which William’s medal card also notes he was in. He is buried in City Road Cemetery, Sheffield. 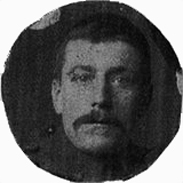 Born at Wakefield on 13/4/1876, he was Private # 21650 Gloucestershire Regiment and 413934 Labour Corps.